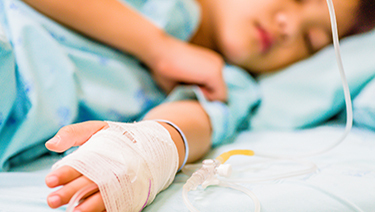 ​A new evidence-based guideline for administering intravenous fluids to children will be published in the December 2018 issue of Pediatrics to provide supportive care for acutely ill children. The American Academy of Pediatrics in 2016 convened a multidisciplinary subcommittee of medical experts to develop the guideline, "Clinical Practice Guideline: Maintenance Intravenous Fluids in Children," after an extensive review of research. Despite the common use of maintenance intravenous fluids, the AAP notes that there has been a wide variety of prescribing practices and lack of an evidence-based guideline for deciding on optimal fluid composition and electrolyte monitoring. The guideline details the best choice of fluid composition for use in patients from 28 days old to 18 years of age. The recommendation does not apply to patients with neurosurgical disorders, cardiac disease, cancer, diabetes or other disorders that are specified in the report. The guideline is intended to prevent a condition called hyponatremia, an abnormal blood sodium, which contributes to a fluid-electrolyte imbalance. This condition can lead to excess water in the brain, causing swelling and other neurological impairment or death.